1860. [Boston:] Warren, . This is one of the most famous portraits of Hawthorne, a three-quarter-length pose of him sitting in a Victorian side-chair holding a slim volume. 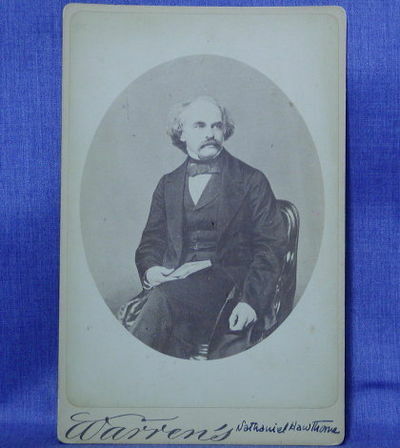 According to Rita Gollin (Portraits of Nathaniel Hawthorne),~Hawthorne acquiesced to the request by Henry Arthur Bright, a friend, to sit for the photographer J.J.E. Mayall on 19 May 1860 in London. Of the three photographs taken, Bright selected this one, which was later referred to as the "Motley" photograph. Gollin says that Sophia [Hawthorne's widow by three months] wrote to Bright in August of 1864 asking that he send her this photograph, which he did.~In 1883, J.E. Baker of Boston (an apprentice of Winslow Homer) created a lithograph from this particular photograph, many copies of which survive today.~This is a cabinet-sized version of the photograph, affixed to a card (total dimensions 6-1/2" x 4-1/4") reading simply "Warren's" -- which was Warren's Photographic Studio, Boston. It is in fine condition (a few tiny spots, card slightly warped as usual, Hawthorne's name inked onto card).